the TWIKE, an electric three-wheeler designed in switzerland. you have caught sight of me and you’re asking yourself what exactly you’re looking at? Well, I’m a TWIKE, a human/electric hybrid. Initially designed and produced in Switzerland for the World Expo Vancouver 1986. 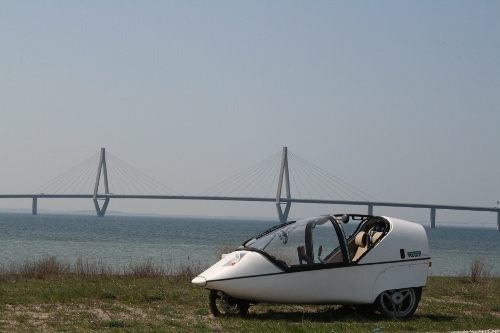 TWIKE’s have been in series production since 1996. Every TWIKE has a unique serial number which can be seen when looking at the back – i’m TW560, produced in Switzerland early February 2000. There are about 1000 out on the streets today – roughly 40 are produced every year in Germany nowadays in a process that takes about a week to complete. How about a quick Q&A to cover all the relevant points you might want to ask about? Q: How far can you go on a charge? A: Depends on what you want to spend on batteries. The TWIKE has a fully modular design and there are a multitude of battery types/sizes available which give a typical range between 40 – 1000km. (this translates to 4k€-55k€ for the battery pack alone!) I’ve been recently upgraded from Lithium Metal-Oxide batteries to LiNiCoAlO2-Cells and currently have a range of typically 370 km (max 461km). However, measured against my meagre average daily travel of 41km (European average: 28km), my owner definitely has indulged in giving me some travel-worthy batteries…which explains why I can frequently be seen far away from my home – Switzerland. Q: How quickly can you recharge? A: Again, the answer is – it depends. It depends on what kind of socket I am connected to. Let’s suppose the batteries I’ve got are completely empty (which almost never happens, see “average daily distance covered” above), and I can connect to a tri-phase outlet, I can recharge at about 140km/h, so recharging takes slightly more than one hour. Using a normal household socket, I can recharge at about 50km/h. My typical, daily (slow) recharge during the night under normal circumstances takes slightly more than 1 hour and given the big range of my batteries, i’ve already covered over 500km/day with regular recharges without any problems. Q: What are the pedals for? Recharging the Battery? A: No, that would be extremely wasteful. The pedals go directly to the drivetrain and drive the rear wheels. Your legs add about 150 watts for as long as you can keep it going (my owner will do about 10 mins at this rate) whilst the electric motor has a peak rating of 6kW – this ratio will give you an idea how far and fast I will go on muscle power only (not very far, nor fast). Usually my owner will use the pedals at a very leisurely pace in order to keep warm in winter (see: “what about driving in winter?”) or to get some exercise after a 14h day at the office on his way home. Q: How do you steer, break etc.? Q: Where and how do you recharge? Q: How much does a TWIKE cost and where can I get one? A: Good question. Anything assembled by hand in a 40/year quantity will cost much in comparison to mass produced products! A new TWIKE will set you back about €24000-€50000 depending on the battery and version. Used TWIKE’s can be found from €8000 upwards. With such vehicles, the state of the batteries can be a very important issue to look into. While the batteries are indeed a major cost factor, you must, however, keep in mind that after this investment you have paid for most of the energy related costs involved getting your TWIKE from A to B and you have no further maintenance costs to care about. (oil, oil filters, spark plugs, emission checks, drive belts etc) TWIKES are built with durability in mind. All materials are either plastic or aluminium – no corrosion, no rust – just wash from time to time. Go to twike.com for purchase options. Q: How much energy do you consume? Q: How fast can you go? A: Me? VMax GPS 98 km/h, which translates to about 105km/h on your dashboard. And, yes, i’m allowed to drive on a motorway – see the Swiss motorway toll sticker! And yes, it is quite a ride at that speed! Q: What do you use this vehicle for? A: Daily commutes, quick dashes out to the local stores (where I excel since my engine and batteries don’t need to warm up to get decent mpg) and about once a quarter a long trip to somewhere interesting – my owner’s wife loves this vehicle since it is small, has beautifully strong torque to get moving at crossings, easy to park and – as she tells me – I’ve got a very feminine design and am very cute! I have driven more than 240’000km and since there is nothing that can rust, I’ll supposedly go another 100’000 km and 10 years without breaking sweat! Q: What about crash safety? A: Physics are definitely against you when we’re speaking about a head-on crash. But, yet again, try crashing a Smart car into a Audi Q7 head-on at 80km/h…the Triton cell might be still intact, but your internal organs have still not survived the crash. I’ve been in a crash already and have been hit by a car at about 70° at 40km/h- given my weight of 200kg, nothing happened to anyone, neither car nor owner – I was just pushed aside, that’s it! The greatest danger by far comes from fellow car drivers which underestimate the TWIKE’s breaking capabilities (200kg with a 350mm diameter disc braking system) or underestimation of the TWIKE’s speed – it is capable of going at >80km/h). We MUST try to lower the average weight of an average motor vehicle drastically – a Golf 20 years ago consumed not much more than a golf does today, but the golf today weighs 600 kgs more! All fuel economy measures mostly went into moving a heavier (and pseudo-secure) car. Q: Driving this kind of vehicle must be cool for the environment, your owner must be a tea brewing green voting tree hugger, right? A: My owner is a Sales Manager for a global Fortune 500 company and responsible for multiple countries and as such flies a lot and, furthermore, has had a very, very bad CO2 foot print in the past, too. Sorry to destroy your stereotype, there. My owner likes the ride (g-forces and all) and the attention he gets from driving a TWIKE. Q: You cannot take much with you, right? A: compared to a Smart fortwo, I have more storage space. Furthermore, I compare much more to a truck: whilst cars usually carry a maximum of ¼ to 1/3 of their total weight as cargo, a TWIKE is allowed to carry up to 250kg additionally – that’s a whopping 112% of it’s own weight! When my owner and his wife travel with me (if they can convince the grandparents to take their 3 kids for a weekend) they take not only their stuff with them, but their dog, too! Q: Where are the solar cells? Q: Your electricity is dirty, how do you know what kind of electricity you’re charging your vehicle with? A: Overall, driving an electric car is NOT a solution to global warming, the world hurtling towards the inevitable decline of cheap oil availablilty and other collateral problems created by the virtually limitless usage of fossil-based individual means of transport. If the owner does not consciously decide on which kind of energy he/she is charging the vehicle with, then driving an electric car might even harm the environment more than driving a green-tech diesel car! I am fed with 100% sustainable hydro-electric energy produced in Switzerland. (…and anywhere I go: just imagine the total electric energy as a lake, filled by dirty water and clean water – I pay for clean water to be filled into the lake – and will take cleaner water from the lake later on. Or imagine you pay in 100€ into your bank and get 100€ from an ATM just an hour later – although the bankote might not be the one you paid in – it is still your money!). Anyhow, the cool thing about electric motororing is that YOU can decide with what kind of energy you are going to go from A to B. Be it Coal or Solar, Hydro, or energy from burning shredded European Policy documents → you are (and should be) in control of this decision, and this seems to pain and scare some very influential forces. Just check out the legislation currently being discussed on how exactly to tax electric motoring and how to control where you might be able to charge your car in the future…scary stuff indeed! Q: What about driving a TWIKE in winter? A: It’s cold, but safe. Given the small footprint of the tyres, the TWIKE’s weight is distributed onto few square centimetres and gives the TWIKE unparalleled grip in snowy conditions. The electric drive and regenerative breaking translates into a very granular ESP which measures traction about 500 times a second and therefore makes the TWIKE a very safe ride in winter. Temperature-wise, although the driver does not experience wind and weather, temperatures inside usually match the outside. This is where the heaters at the front come into play – They keep the windshield clear. As to the driver: Dress warmly and use the pedals to keep warm! Q: Battery technology will progress and I will be able to charge my vehicle in 90 sec to go another 500km. Next electric car generations will be much better. – what have you got to say to that? A: That seems like a technically challenging but interesting feature which you will be using very, very seldomly. (see “average daily distance covered” and “where do you charge”) It is certainly better to get your head around the fact that the current view of mobility is quite warped. Just as you would never buy a bike with a permanently mounted trailer and always ride it whilst wearing a backpack, just in case you would – once a year – need to transport lots of stuff, you should not choose a car along those lines. Renting the big car you might require to go on vacation once or twice a year might be, in fact, very cheap! Q: I love the TWIKE, i’d like to know more! Where can I get more information? A: Well, not much is available in English. A good point to start is Wikipedia, www.twike.com, www.twikeklub.ch and to get in touch with my owner here – he will be very happy to answer any questions and go into any level of detail necessary!